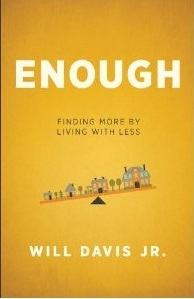 book review, Enough, simple living, stewardship of financial resources, Will Davis Jr. I was blessed with an opportunity to review Will Davis, Jr.’s new book Enough, for the Patheos Book Club at Patheos.com, a great website that hosts a wide variety of excellent conversations about religion and faith. The book was released this month. Please click here to discover my musings under the book review tab of this site.